October 10, 2010 – You know when you were a kid at Christmas time, and your Sunday school teacher opened the Bible to the book of Luke and said, “This is what Christmas is really all about?” Or maybe it was Linus that told you, I don’t know. Well, Halloween has its holy text, too…and it doesn’t guilt you for digging Santa Claus. In my previous post on Ray Bradbury’s Something Wicked This Way Comes, I stated with minimum equivocation that I believed it to be his greatest work. That was me wearing my objective hat (it’s soft, colorful, and divides into three limp points, each with a round dangling bell at the end). 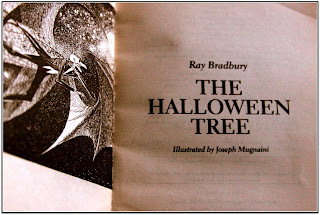 However, subjectively, his 1972 work The Halloween Tree is by far my absolute favorite Bradbury book. Sure, part of that is because of my affinity for Halloween. Aside from the content, though, there is something about his writing in this (ostensibly children’s) book that seems, I don’t know...more Bradbury than Bradbury. It's like he started at sentence one, "It was a small town by a small river and a small lake in a small northern part of a Midwest state," and then didn't pause, didn't edit, didn't backtrack, didn’t plot, didn’t waste time on Minesweeper until he finished up at the end with, “At two in the morning, the wind came back for more leaves.” I then imagine him throwing his glowing red pen down with a throbbing hand into a nearby bucket of water with an incredible hiss of steam and sinking back, exhausted, proud, and somewhat uncertain of what just happened. I kind of read it that way, too. Or I’m just getting so out of shape that even reading leaves me breathless. When other people write about Halloween, it often seems like they’re just checking off tropes. “Did I mention jack-o-lanterns? Check. What about Autumn foliage? Check. Haunted house? Crap, I forgot the haunted house. 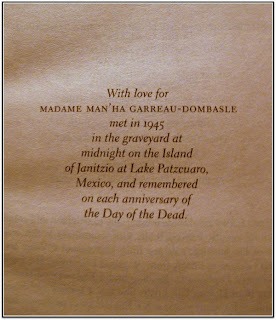 Let me squeeze that in right here after the token graveyard scene.” But with The Halloween Tree, Bradbury’s treatment of Halloween is more organic, less like he’s writing about an established holiday and more like he’s creating it from scratch, from creeping pumpkin vine and stone-entombed mummy to looming harvest moon and broom-borne witch. The book tells the story of eight costumed trick-or-treaters on a Halloween night who discover something direly wrong with one of their friends, a boy of boys by the name of Joe Pipkin. Bradbury spends a whole amazing chapter describing Pipkin (“The day Joe Pipkin was born, all the Orange Crush and Nehi soda bottles in the world fizzed over.”) that is almost worth cracking the book’s spine by itself. Don’t get the wrong idea, though. This isn’t one of those overtly educational kid’s stories that throws out aesthetics and art just to teach oversimplified lessons about life. In fact, more than likely the historical accuracy of the book is warped. But that’s irrelevant. So irrelevant. Bradbury is going deeper than mere facts about history and culture in The Halloween Tree. He’s talking basic humanity here. And the most basic thing about humanity is that we die. I mean, death is as much a defining characteristic as anything else we celebrate—living, eating, loving, achieving. It’s what all cultures have in common, whether its ancient Egypt or modern-day Mexico, and each culture has its own festivals that it has used for centuries to deal with death. In fact, Bradbury’s overarching and brilliant metaphor for our fear of death is that around this time of year, the sun goes away for longer periods of time, in the past leaving ancient man to wonder if it’s ever coming back. Because for all they knew it wouldn’t. It’s a great metaphor for death even now, where, thousands of years and billions of deaths after the advent of mankind, we still don’t know if the sun will rise again afterward. So, once a year, we allow ourselves to get closer to the mystery of death than we are usually comfortable, clothing ourselves in nightmare, venturing out after dark, and turning fear into a play thing. For one day, we let it be okay to look death right in its scary, bony face and chuckle. 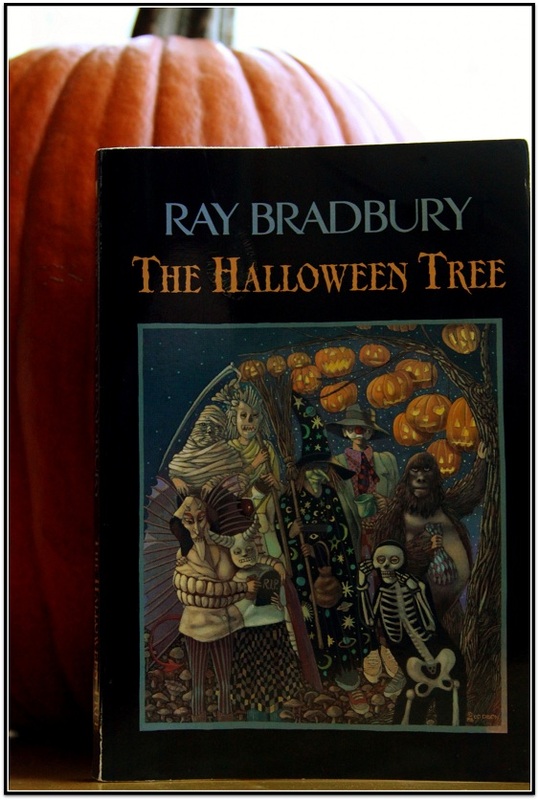 I could fill up the entire Internet discussing Bradbury’s The Halloween Tree, but for this forum, in this type of space, for the amount of time I have, this’ll do. 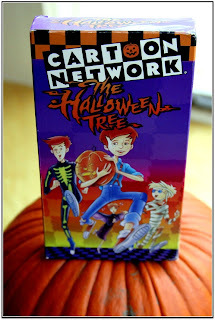 However, there are a few maintenance points about The Halloween Tree to which I’d like to attend. 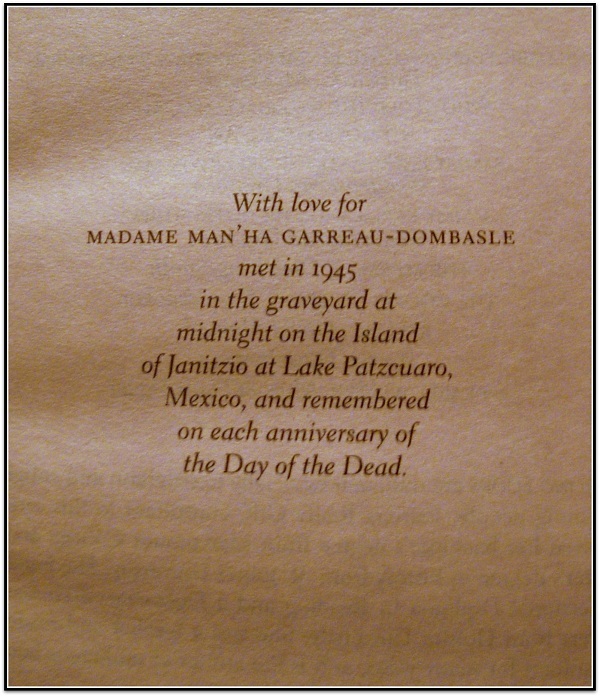 First, the book also has one of the best dedications I've ever read. I’ve included a picture so that you can read it and disagree with me. 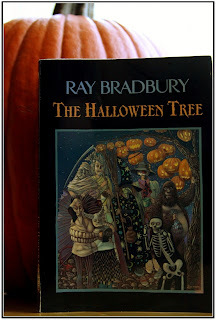 Second, you should know that every year since 2007, Disneyland in California turns one of its oak trees into a Halloween Tree dedicated to Ray Bradbury himself, who actually has a career history with the company and attended the dedication. Besides a placard denoting the fact, Disney festoons the tree with yellow and red lights and hangs fake pumpkins from the tree branches, each one printed with jack-o-lantern faces and masks from the original 1972 Joseph Mugnaini illustrations for the book. Seeing this tree would be the only reason I’d ever spend Halloween in southern California. Well, that and this. 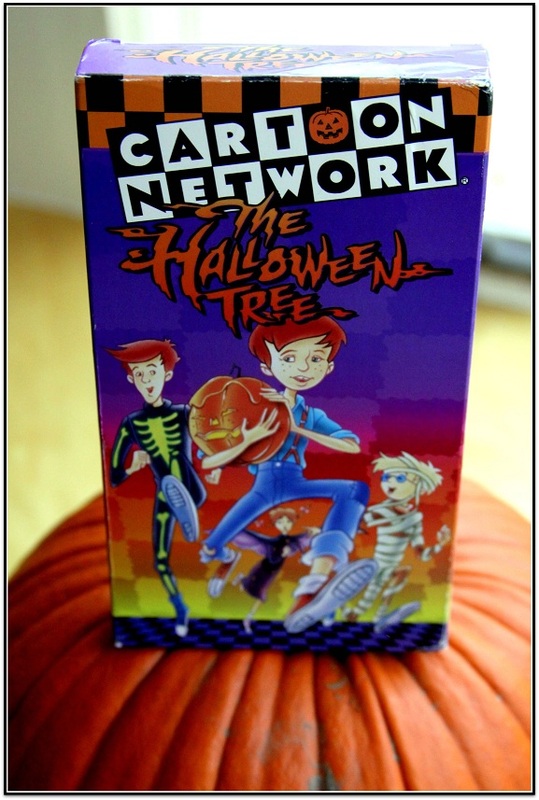 Finally (in more than one sense of the word), in 1993, The Halloween Tree was adapted into an animated movie written and narrated by Ray Bradbury and starring Leonard Nimoy as the voice of Moundshroud. It’s an amazing version that in some ways improves on the original, even if it does gentle it a bit, while still incorporating most of the important ideas and images of the story. Despite what a good adaptation it is and the fact that it was awarded an Emmy, it has yet to be released on DVD. In fact, the only reason I still have a VCR in my basement is so that we can watch the cassette version of the movie every October. I’d go into more details about the film, but I still may write about it in full for this blog. However, just in case I don’t’ have time to fit it in, I wanted to at least mention it. Now do me a favor and go heat up some cider, open up your windows to October, and start reading the book…even if you have to sacrifice reading this blog for the rest of the season to finish it. Well, still click on some of the pages for me. I could use some help with the hit count. On you advice, I borrowed this book from my Library to read to my 7 year old son. He was asleep by the time I got to the pipkin chapter but I was up late just to finish it. It was excellent . Thank you. I read alot, very few books suprise me , this one did. It's beautifully written . Again - thank you and happy Halloween !